Polytechnic or the Institute of Technical Education (ITE)? The choice may seem obvious to most. But Timothy Jung Ming took the unconventional route which took his friends - and even himself - by surprise. He chose to study culinary skills, which was then a new course at the ITE, instead of business administration at Republic Polytechnic. Looking back, the 24-year-old said he is glad he followed his passion for food. He graduated top of his ITE cohort and took part in two global competitions. In March this year, he was accepted by the renowned Culinary Institute of America which counts TV food show host Anthony Bourdain and celebrity chef Cat Cora among its alumni. Mr Jung admitted that it was not an easy decision to turn down the polytechnic offer, which many regarded as having better career prospects. After taking his O levels at the now-defunct Monk Hill's Secondary School, he had hoped to get into Temasek Polytechnic's culinary course. Mr Jung, who worked as a waiter in a Western cafe during school holidays as a teenager, knew this was what he wanted to do. But his application was unsuccessful. Instead, he was offered a place to study business administration at Republic Polytechnic. He considered other options, including going to the ITE. But he struggled with the thought of being an ITE student. "I thought I would be better accepted by society if I had gone to polytechnic," he told The Straits Times. "I wasn't keen because I thought ITE had a bad reputation and I didn't know how far I could go from there." His financial manager mother, Ms Lee Tee Mui, 59, was a big influence. "She helped me think, and I decided that I really wanted to cook, so I'd rather go to ITE than take a course I didn't like." Said Ms Lee: "I told him to do something that he'd be good at, rather than chasing something that other people think is good." His time at ITE proved his initial thoughts wrong. Not only did he learn to cook, he was given the opportunity to take part in competitions. 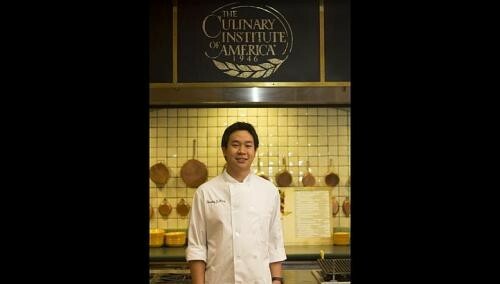 In 2008, the culinary skills (Western) student graduated top of his cohort, and was awarded the Lee Kuan Yew gold medal for outstanding academic performance. One year later, he also took part in two global competitions - the prestigious Bocuse d'Or, a culinary contest held every two years in France, and the World Skills Competition in Canada. With his results and resume, he was accepted this year by the Culinary Institute of America in New York, which has been consistently ranked the top cooking school in the United States. After three years, he will graduate with a Bachelor of Professional Studies degree in Culinary Arts Management. Mr Jung, who has two older brothers and a younger sister who have graduated from or are completing university soon, said: "Going to school is not about getting a piece of paper. "The greatest success was not so much the medals and awards I've attained but the knowledge and experience gained in the process." Most people with a passion for food would open restaurants, but he hopes to do more than that. "There are other ways to contribute to Singapore's food industry, like doing research in innovative and sustainable methods of food production," he said. "I know I'm on the right path, because I'm learning more about the community and people, and discovering more about myself."